Unfortunately, Ukraine, which has long opted for a European way of development, still has a problem that is not characteristic of a civilized society: the problem of violence against animals. Despite active animal protection movement, homeless cats and dogs still roam the streets of Ukrainian cities, natural environment is destroyed, and wild animals are captured and kept in private zoos with no proper conditions. As this topic is not a priority for the government, activists unite to protect nature and animal rights. Kyiv, August 29, 2016. On August 31, the first public signing of the Declaration of Animal Rights (hereinafter – the Declaration) will start in Kyiv in Poshtova Square at 7pm. The action will be dedicated to National Animal Rights Day. 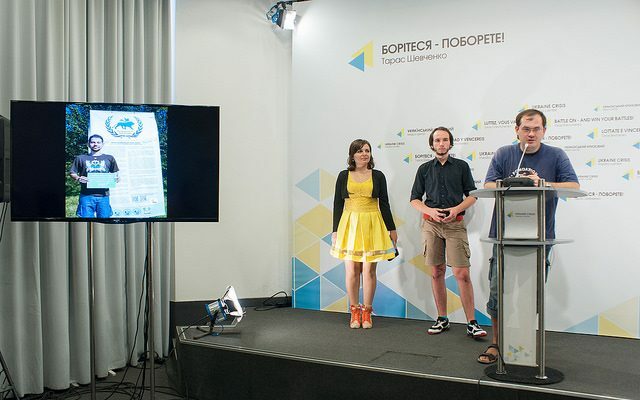 Animal rights activists told about the initiative at a press briefing held at Ukraine Crisis Media Center. “Animals, in fact, have no rights yet – they are a resource to meet the needs of people. My dream is that the Declaration should be recognized by the UN and other international organizations,” said Ksenia Vlasenko, initiator of the action, singer and animal rights activist. “Protection of animal rights is a sign of democracy. Signing the Declaration and recognizing animal rights is another step away from the totalitarian past,” said Oleg Andros, Union of Free Journalists “Nature above all”. Besides the official part and signing of the Declaration, there will also be a concert of famous Ukrainian artists and tasting of vegetarian dishes. “Despite the fact that the country is at war and the situation is very difficult in general, they agreed to find time and perform for free during this social action. This shows that they really care,” said Ksenia Vlasenko. Declaration of Animal Rights originated 4 years ago as a European initiative. Ukraine joined it in 2014. “We recognize animals as living individuals who have the right to live, to have a family, to have access to food and water, and the right to be free and have their own territory […] These rights derive from the five freedoms of animals as living beings, capable of feeling the same basic feelings as we do- it’s freedom from hunger, stress from unnatural behavior, freedom from fear and offence,” said Nina Semchyshyn, Information and Analytical Bureau of Animal Advocates animal lawyer. She added that de facto animal rights are violated at every turn – in show business, meat, milk, fur, cosmetic and pharmaceutical industries. “There is a more humane alternative, but it has not become so widespread yet,” stated Ms. Semchyshyn. The activists noted that at present the Declaration has no legal force and is only a manifestation of personal items. “The main idea is not whether it is supported by public authorities, but that the Declaration exists and it works. It is signed by people, and these people have real power,” noted the activists. When the Declaration gathers 50,000 signatures, it will be submitted to highest world institutions with the demand for its official recognition. Animal rights advocates noted that the situation is gradually improving in Ukraine. In 1996, for example, they managed to close the animal control institution in Kyiv, where homeless animals were killed; in 2006, the law “On protection of animals from cruel treatment,” was adopted; many NGOs that deal with the protection of certain species or offer alternatives to experiments on animals were founded. Unfortunately, many problems remain unsolved. The issue of stray animals is very important. “In Ukraine, the owner, who dishoused a cat or dog is not responsible for this. In Europe, fines of thousands euros are imposed on such people. In fact, none of the animal shelters in Ukraine meets the European and US animal management standards,” noted Oleg Andros. The second problem is the protection of species included in the Red List of Threatened Species, especially those illegally kept in private menageries, because the legislation does not provide for the procedure for their removal. One such example is the case of two white tigers removed from the private zoo. “They have been taken to Kyiv zoo and are still living. But in fact, they are left in legal limbo. They belong neither to the previous owner nor to the Kyiv zoo,” explained the animal rights advocate. The third problem is that people who abuse animals often avoid responsibility. “There are only few precedents in Ukraine when people were placed in jail for cruelty to animals, not just for abuse, but for publishing videos with brutal shots,” noted Oleg Andros. Ksenia Vlasenko added that in the future the activists plan to organize a series of related events. In particular, they will organize a display of man-made fur products and Vegetarians’ Day.